Reports about January's fundraising numbers, released on February 20, have focused on two narratives: Mitt Romney's limited fundraising and high burn rate and the role that super PACs are playing in an increasingly contested Republican primary. HuffPost decided to combine those narratives together to make a graphic of candidate and super PAC fundraising and spending in January. Newt Gingrich and his allied super PAC, Winning Our Future, out-raised Romney and his allied super PAC, Restore Our Future, by $3.5 million in January. 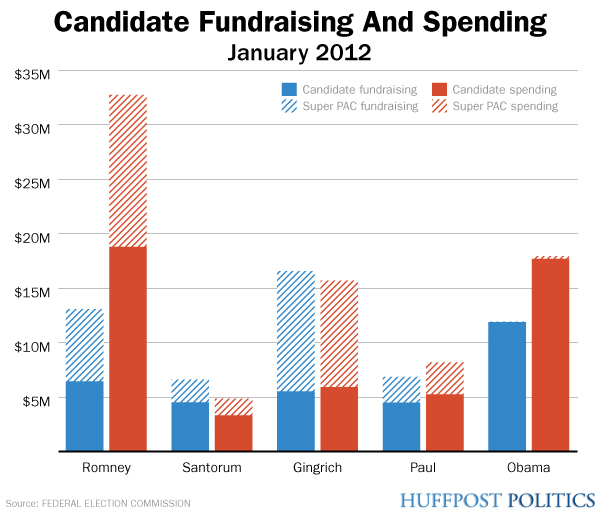 Gingrich was the biggest beneficiary of super PAC spending. Romney, meanwhile, is clearly the biggest spender of all the candidates, having dropped $18.7 million in January. His super PAC added an additional $13.9 million. Comparing the spending by Romney's allied super PAC with that of Barack Obama helps explain why the president reversed course and began encouraging super PAC donations. The Obama-allied super PAC, Priorities USA Action, raised only $58,815 in January and spent $258,025. While Obama's spending is on par with Romney's, he would have to spend much larger sums to compete against Romney and his super PAC.